For each shipping address, enter the quantity of item(s) above and choose or add the recipient's name below. Add to Cart for each shipping address. NOTE: You may reassign product ship to names at checkout. 2 1/2 pounds of Mother Myrick's best! 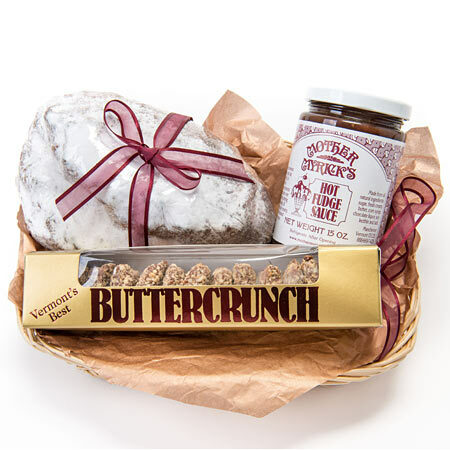 Beautifully packaged, it contains a delicious gold box of Buttercrunch, a 15 oz. Jar of our mouth-watering Hot Fudge Sauce and our award winning Stollen. As a team, they make a business or personal gift of lasting impression. Exclusive offers and sales, new product updates, more. No obligation, unsubscribe anytime—give us a try! ©2019 Mother Myrick's. All Rights Reserved.